A leak in the roof is never a good sign. Unfortunately, it’s at times unavoidable. The sooner you catch and fix a roof leak, the better your commercial establishment is and your business operations will remain unhindered. Commercial roofing is not a one-size-fits-all project. Many factors affect why you may be experiencing a leak. You may even have a leak and not be aware of it. There are other signs of a leak apart from seeing water inside your commercial building. In today’s post, we will enumerate the ways you can spot a leak in the roof of your building and how best to address it. Extended exposure to water will give any type of ceiling systems some discoloration. If the leak is close to a wall, the water stains could flow down the adjacent wall. If you see this scenario, then there could be water damage inside the wall. Damages to your roof can cause leaks into your building. By being vigilant, you can catch a leak and correct it before it even enters your building. Ensuring that you have a commercial roofing maintenance plan in place will significantly help in finding leaks. A roofing maintenance plan will involve a contractor cleaning your roof regularly and repairing it as needed. Poor drainage – clogged drains will lead to standing water to gather and look like small ponds on your roof. Alligatoring – this scenario manifests itself through aged and weathered roof surface or membrane that appears bubbled or cracked. Holes in membranes – whether it’s something hitting your roof, a hole or tear is a quick fix if detected early. Open seams – the sides of the membrane can become detached. 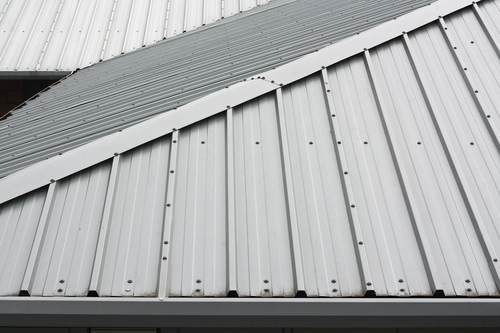 Broken flashing – severe weather can cause the metal flashing on your roof to become damaged. If a foul smell is emanating from your facility, then it could be a sign for mold. Mold likes wet and moist environment, so if your building is frequently exposed to water, then there’s a high probability that mold could spread. 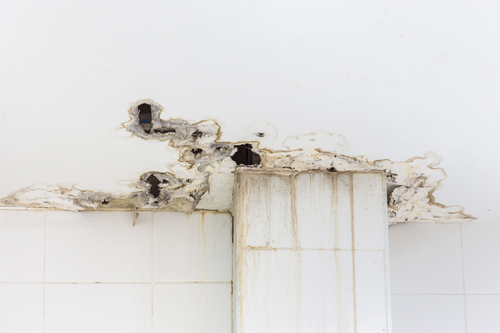 If you suspect a mold problem in your commercial building, seek treatment right away. We will discuss mold remediation in commercial establishments in a future post. Whether it’s dripping and dropping above your head or creating a puddle on the floor, water entering your building is the most obvious sign of a roof leak. This issue could lead to damage, not only to your roof and structure, but it could also break equipment and devices in your building along with other essential business items. If there is a leak in your commercial roofing, then it saturates the insulation before water enters your building. Aside from wet insulation, holes in your roof can lessen the insulation capacity of your facility. When your commercial establishment can’t hold warm air during colder months and cool air during warmer months, then you will eventually experience a spike in your energy bills. This is the result of your heating and cooling unit working harder to make up for the lack of insulation. When there is water entering your building, clear the area of any foot traffic, equipment, and supplies, so you minimize the damage. When the section is clear, keep the water from gathering on your floor by catching the water in a bucket. This is a temporary solution to minimize interior damage while you’re waiting for your roof to be repaired. Mark the areas where you see the leaks. Doing this step will help your roofing contractors fix the problem, and your insurance providers provide a claim you are entitled. It’s best to mark the points of entry of leaks while it’s occurring; otherwise it may be difficult to detect where the leak is once the area is dry. Even if you see where the leaks are visible, investigate for more affected areas. You may think the leak is limited to one space, but there might be problems in other places in your building. If you see any leaks but you know that it has not rained in your area, then it may be due to HVAC or plumbing issues.